DD Form 350 or the Individual Contracting Action Report is a form issued by and used within the Department of Defense (DoD). It is used for recording and storing information on each contract for goods and services initiated between military agencies and the private sector. The latest edition of the form was released by the Department in October 2003 and can now be filled digitally. You can download the up-to-date fillable DD Form 350 below or find it on the Executive Services Directorate website. 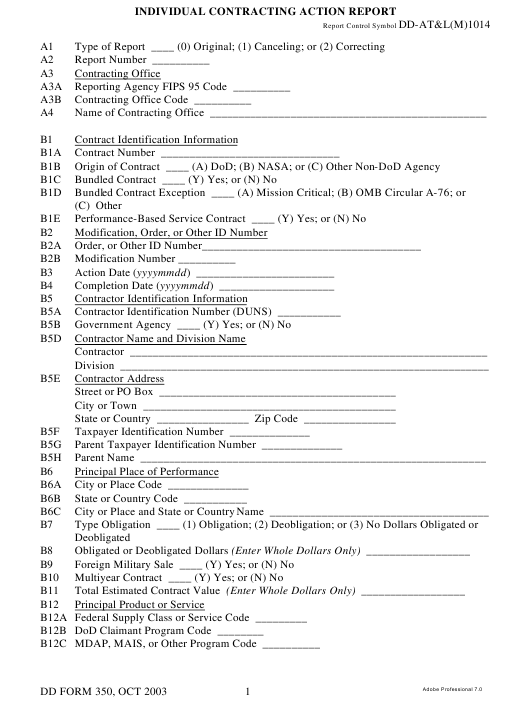 This paper belongs to the Records of Prime Contracts Awarded by the Military Services and Agencies (DCADS) series together with the DD Form 1057, Monthly Summary of Contracting Actions. Both of these forms are used for collecting and containing the data about the size and distribution of contracting actions, numbers, amount, types of contracts placed, competition information, etc. Service; or (F) Noncommercial Service. Do not complete Part C if Line B5B is coded Y. Do not complete Part D if Line B5B is coded Y or if Line B13A is coded 6. The DD Form 350 is used during the preparation of annual financial reports. For all the activities under the Standard Procurement System (SPS), the bar date for filling out the DD 350 is the last day of each calendar month. For all the other systems, the deadline is the 25th of the month. The list of codes necessary for completing the form DD 350 can be found in Section 253.204-70 of DFARS PGI 253.204, Administrative Matters. Part A identifies the report and the reported activity. This section must be filled out completely before the DD 350 can be submitted. Part B describes the transaction itself. It contains all data regarding contract identification, its number, origin, ID, the delivery date, and details about the contractor. Furthermore, this section should include the information about the products and services provided under the contract as well as the place of performance, estimated value of services, etc. Part C summarizes the details regarding the contracting procedure, data concerning the use of competition, the number of offerors solicited and offers received and provides the necessary financing data and statutory requirements other than socioeconomic (which are described in Part D). Part D contains information about the type of the contractor - including the type of entity, ethnic group, and ownership information - and is coded to describe the original contract. Part E gathers data on specialized items that are not considered to be permanent reporting data. Part F identifies the reporting official by providing the name of the contracting officer or representative, their signature, telephone number and the date of signing. Installations with Defense Switched Network (DSN) must enter the DSN number in the telephone number field.